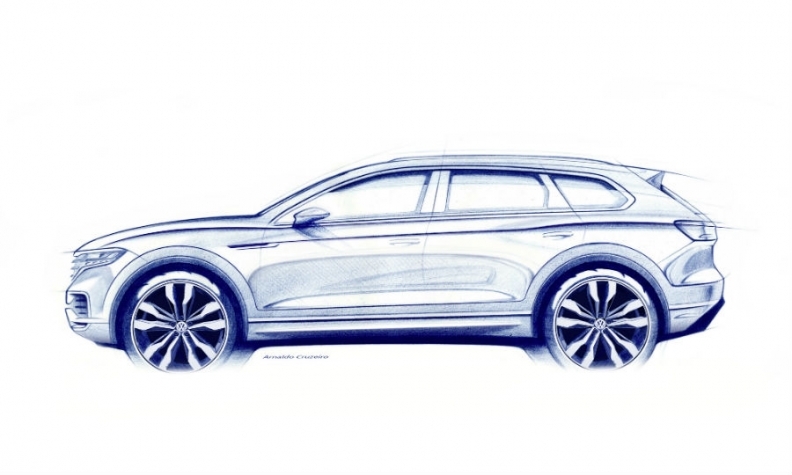 A sketch released by VW shows that the Touareg gets a sloping roofline. Volkswagen brand is counting on advanced connectivity features to boost sales of its new-generation Touareg. VW brand's flagship model will have a connectivity level that makes it a "driving internet node," the company said in a statement, released ahead of the SUV's debut at the Beijing auto show on March 23. It will also have one of the largest digital cockpits in its class, VW said. VW also promised that the latest Touareg will entice customers with expressive design, innovative technologies and dynamic handling thanks to features such as air suspension, rear-wheel steering and roll stabilization. "The Touareg has demonstrated its performance power and driving capabilities impressively, in around one million units, ever since the model series launched in 2002," VW said. The Touareg shares its architecture with the Audi Q7, Porsche Cayenne and Bentley Bentayga. The current model starts at 54,700 euros in Germany. VW has not yet disclosed prices for the new model. European sales of the Touareg fell 20 percent to just under 14,000 last year, according to JATO Dynamics.